Our slimline LCD Designer Advertising Screen with a choice of frame integrates well with a wide range of design themes. Crafted to fit well with both traditional and contemporary interiors, this slimline display is perfect for advertising, informing or entertaining, making it the ideal choice for a variety of applications including reception areas, information points and retail stores to name a few. Available in portrait and landscape orientation, both custom sized and over sized options with an optional wall mount, this Designer Advertising Screen is manufactured with an HD resolution and a protective glass fascia, meaning it excels in public display applications. With a built-in HD media player, and plug and play USB connection, content can be loaded easily onto the screen’s internal memory. The advantages of this screen are numerous, from it’s slimline design to its display specifications, this product excels in a wide range of applications without taking up too much of that all important space. Stylish, sleek and slimline, a Designer Advertising Screen from Pro Display offers much more than many digital signage alternatives. This product is compatible with Pro Display touch and Wi-Fi options. Please contact us for more information. Pro Display offers a wide range of Digital Signage displays to suit a variety of requirements, including LCD High Brightness Screens for indoor applications with high ambient light. 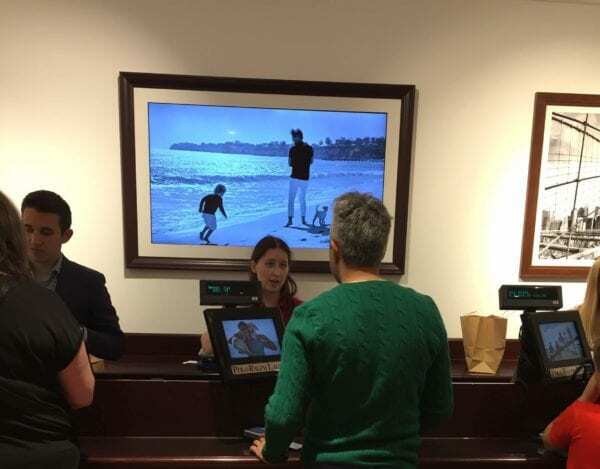 For alternative decorative framed signage, Pro Display also offers Mirror TV Screens with a choice of frame to suit any contemporary or traditional interior (optional custom frames available). We manufacture in Britain and ship worldwide – if you need further information, a pricing quote, or want to discuss ideas for using our Designer Advertising Screens please complete the form below, or call us on +44 (0)1226 361 306.